Even if you’ve built an amazing tool, no one will use it if it looks like a clunker in the store. You can create winning screenshots with AppLaunchpad. Say you’re invited to dine at Buckingham Palace with monarchs from around the world. Would you show up wearing a bathrobe? Of course not. It’s unthinkable, right? Yet, app creators do it all the time. After all their hard work, at last about to go live on the App Store and Google Play and join the company of app royalty, they hurry their app into terrycloth screenshots and expect to be fed like a king. Choosing to give your app anything less than outstanding screenshots on your app pages is a big mistake. This shouldn’t come as a surprise to anyone. Understandably, plenty of Founders press forward thinking I can’t pay a developer any more to design screenshots or every time there’s a new release and I need to make updates, or I have too many other tasks to concentrate on. Understandable. But, when there are tools that make the job simple and affordable, not forgivable. is an easy-to-use DIY tool for creating beautiful screenshots. Using predesigned templates, straightforward prompts and filters, AppLaunchpad enables anyone to quickly assemble custom images. 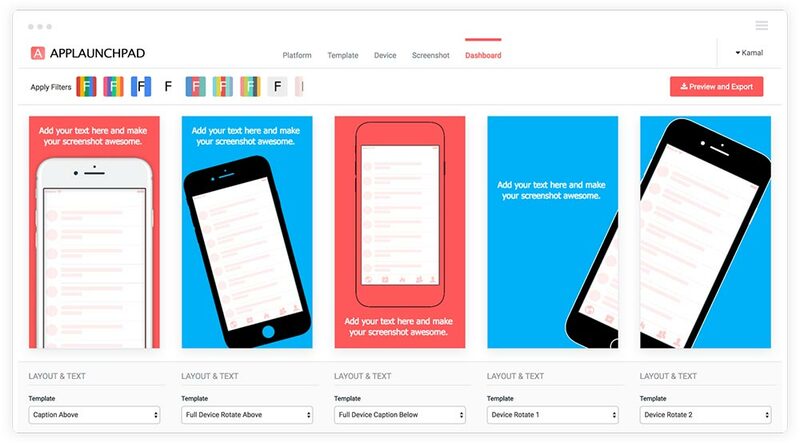 An intuitive, one-page editor guides users through selecting a template, uploading an app screenshot, adding captions, changing colors and fonts, and downloading images for use. The AppLaunchpad website provides a wonderful demo that allows guests to immediately try out the tool and gain an appreciation for how well it works. Many developers turn to Photoshop because it allows for great originality but it is also a more time-consuming and complicated tool. AppLaunchpad gives creators a customized look with much less hassle – that goes for any device. You can either upload specific screenshots, or AppLaunchpad will automatically resize your screenshots with the required resolution for all device sizes. Consider that you now have as little as eight seconds to grab the viewer’s attention. With app pages opting to minimize descriptions and focus on the visual representation of an app, it’s imperative that screenshots be striking. Is your app fun? serious? What makes it distinct? All those tiny details – color, font, background, the caption – reflect your app’s character, both its function and personality. Aside from the app itself, convincing people to download your app depends greatly on the quality of those screenshots. Your app is better than a bathrobe, isn’t it? It costs nothing to get started using AppLaunchpad. Paid plans, which provide access to more templates and devices as well as additional features, begin at $25 per month. If you need help designing your screenshots, you’ll find excellent guidelines here. AppLaunchpad plans to introduce AI in the future that will recognize your apps color themes so it can then recommend the perfect designs. To learn more about the app and new features, visit here.